Well as we all know nature is good for our well-being. It is increasingly accepted that having nature nearby is important for human well-being. Being connected with nature is about feeling close to the wider natural world. A relationship that helps us feel good. But with the growth of urbanization, pollution, overpopulation is reducing the quality of living. People are now willing to relocate to lower density areas to find more natural lifestyle and away from polluted environment. For the people who are desiring to live away from the city chaos, Pacific Golf Estate is making their dream come true. Pacific India is offering the most remarkable and luxury homes in Dehradun which is Pacific Gold Estate. This is a premium luxury residential project for the people who want to live around nature. The most majestic element of this project is that is it surrounded by the Himalayan ranges which will give a mind blowing and rejuvenating view. Apart from the natural surrounding and green environment, these apartments in Dehradun are lavish and modern and are equipped with all the exquisite facilities and amenities that will make you happy and delighted. The project is spread over 35 acre which resides on a beautiful location of Sahastradhara road and is well connected with the various mode of transportation. It also features a 9-hole golf course designed by Graham Cook. 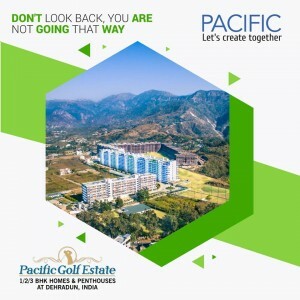 Pacific Golf Estate is the best property in Dehradun to invest in for a secure and relaxing future. So, don’t lose this opportunity of living with nature because escaping into nature is pure bliss.